Tights designed to “activate your movement system”. Wow, sounds impressive, and they are! The Dual-Tec 2.0 3/4 Length Tights use patented technology to align and support your muscles, joints, and neural components so that you have better mobility and stability, helping to optimize your performance. There are 21 specially designed panels that hug and connect key areas of your leg to ensure the best fit and function without restriction. You’ll especially feel the difference in your knees and hip joints so that you can continue to do your TrailblazerGirl activities for longer and without pain. You’ll also notice that your recovery time is quicker too, because there’s less muscle fatigue. Smartly, the fabric is breathable and moisture wicking with an anti-odor treatment. 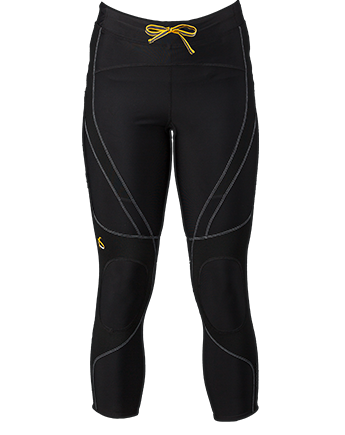 With the cold weather, these tights work well as a base layer under your ski bibs or hiking pants, and when the weather starts to heat up, they will be fine on their own. Power the way you move and feel less pain with Opedix!